Author Hector Lassiter suggests to a mysterious woman that he has just met that they go to the Cobalt Club. The woman replies that it sounds better than the Pink Rat. Lassiter and the woman, Cassie Allegre, leave the Cobalt in a cab driven by a man named Moe. The Cobalt Club, the Pink Rat, and Moe “Shrevvy” Shrevnitz are from the Shadow novels. Lassiter’s friend Orson Welles appears in the book, and reference is made to him voicing the Shadow on the radio. However, the comic book story “To Cloud Men’s Minds” (The Shadow Strikes! #7 by Gerard Jones, Rick Magyar, and Frank Springer, DC Comics, March 1990) establishes that Welles (or Grover Mills, to use the pseudonym given to him by Jones) did briefly produce a radio show loosely based on the Shadow’s exploits in the CU. This crossover brings Hector Lassiter into the CU. 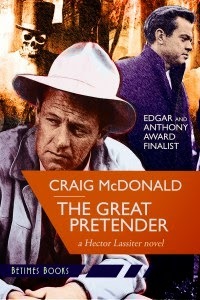 The Lassiter novel Print the Legend introduced writer Chris Lyon, who went on to appear in his own series of novels by McDonald. Chris’ cousin Tell Lyon is the main character of McDonald’s standalone novel El Gavilan.